As a personal health care advocate, I primarily help people improve their outcomes during hospitalization by protecting their autonomy when they cannot do so themselves. Although my primary goal is to enforce each client’s personal health care directives when he is in a hospital, I find that many people have not decided what those directives are, often because they believe the process of doing so would be both expensive and time-consuming. In fact, it does not need to be either. First, let’s take a moment to review what advanced care directives are and when they are used. 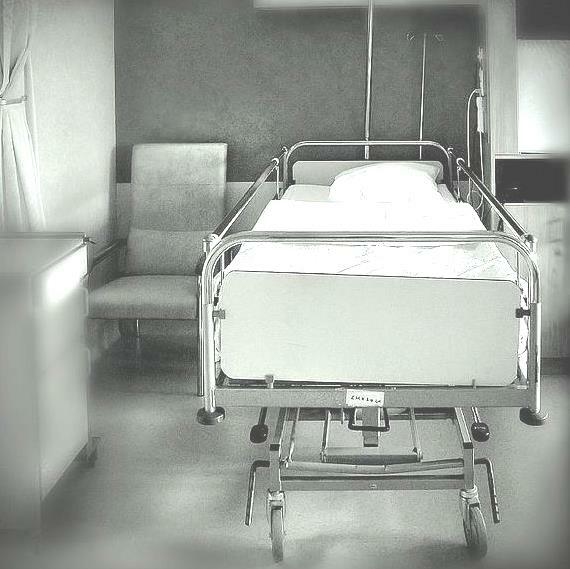 Sometimes when a person has a near-fatal accident or life-threatening illness, doctors need to make decisions about the degree of care they will provide. Normally they are required to discuss these options with you (or your family members if you can not communicate) and abide by your wishes. Advance directives are legal documents that allow you to spell out your decisions about both the type and amount of care you wish to receive ahead of time. It gives you a way to express your wishes to family, friends, health care providers and advocate to avoid confusion later on. In some cases, the treatments that can be provided will only extend your life, not cure your illness. These are called life-sustaining treatments. 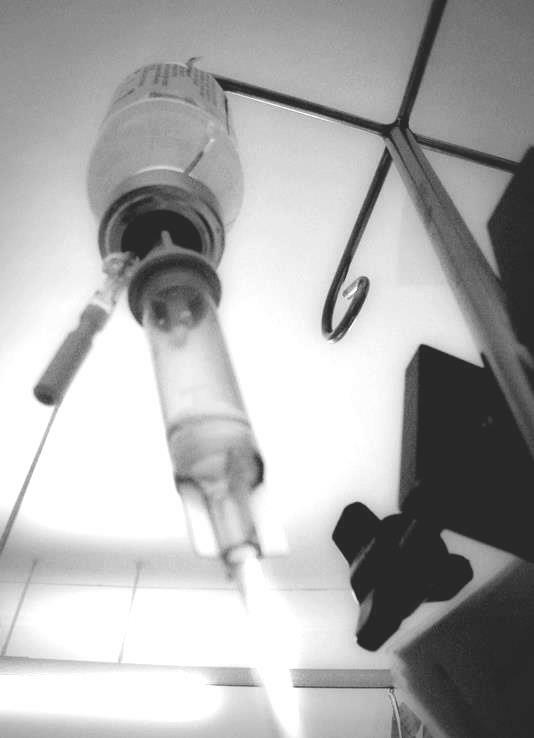 Treatments to extend life can include the use of machines, such as a ventilator to help you breathe or a tube in your stomach to provide nourishment, according to the National Institutes of Health. By completing an advance directive, you are letting your care providers, family members and advocate know in advance how and when you would want these types of life-sustaining treatments used if you are incapacitated by accident or illness. This is one of the most important things you can do because if these decisions came up later and you hadn’t expressed your wishes, others would make these choices for you. Preparing an advance directive spares your family members the pain of trying to make these choices without knowing what you would have wanted. What you may not realize is that spelling out your wishes is fairly simple and inexpensive to do. In fact it is so easy and affordable, I recommend that every one over the age of 18 complete an advance directive, even if they are in good health. Accidents do happen and can leave you unable to communicate. The advance directive I use with my clients is called Five Wishes It takes about an hour to complete, and it only costs $5. In 1998, the American Bar Association helped the nonprofit group Aging With Dignity develop an advance directive for nationwide use. 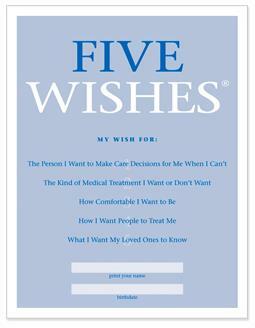 Now available in 27 languages and in Braille, Five Wishes has been used by 18 million people, distributed by over 35,000 partner organizations and is recognized as legal in 42 states and the District of Columbia. The other eight states (Alaska, Indiana, Kansas, New Hampshire, Ohio, Oregon, Texas and Utah), require a state-specific form that can be included with the Five Wishes so it can be used as a guide to your directives. Five Wishes is broken down into five sections, or wishes. The first two are the legal components required of an advance directive. Wish 1 allows you to assign an agent who will be able to make decisions on your behalf if you are unable to do so yourself. This person is often referred to as a proxy, surrogate or health care representative. Wish 2 is a living will, where you define what kinds of life support treatment you would want if you were incapacitated and how long you would want it to continue. Wish 3 lets you answer questions that will define the level of comfort care you would receive and includes questions about pain management and hospice care. Wish 4 lets you define how you would like to be treated by others. You can specify a preference to be cared for at home, and whether you would like to allow others to pray by your bedside. Wish 5 lets you say anything you would want those you love to know. This can help deal with issues such as forgiveness, how you wish to be remembered and your final wishes regarding funeral and memorial plans. The document can be purchased in several formats at Aging With Dignity’s website. You can order a hard copy to be mailed to you, or you can fill out an online version that you can then have emailed to yourself, your family mem bers, your advocate or even your doctor. You can even purchase multiple copies and have them sent or emailed to people you know as gifts. All of these options create an identical document, and all cost the same amount, only $5. I strongly recommend you schedule the time for you and your family members to complete an advance directive like Five Wishes now. The cost is small and the time it takes is minor. I can assure you, however, that the guidance it can give to your future possible care providers, advocates and those who love you is absolutely priceless. ‹ PreviousWhere is the Health Care Poverty Gap?